Unlike many of the strange animals that have been featured on the site, it's pretty much obvious why C. cristata is commonly known as the Star-nosed mole. 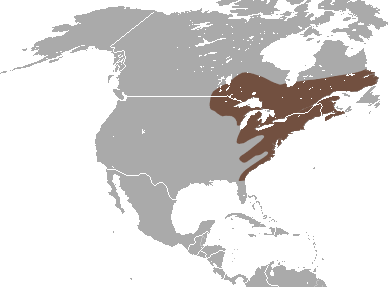 This small, weird-looking mole of the Talpidae family occurs in wet lowland areas of eastern Canada and the north-eastern United States. Records of the species, extend along the Atlantic coast as far as extreme southeastern Georgia. Adults have a length of 15 to 20 cm (6-8 in.) and an average weight of 55 g, with their bodies being covered by a thick black to brown water-repellent fur. The tail is long and thick and is believed to act as a means of storing fat for use during the breeding season. They have large, scaled feet and a mouth with 44 teeth. Females have 8 mamma and males have very large testes, up 8.8% of the total body weight! Not much is known about their lifespan, however it is speculated that they may live up to 4 years in the wild, with many specimens recorded to survive for up to two years in captivity. The species' most distinctive characteristic is the star-like structure that surrounds the snout. This "star" is made of 22 mobile, pink, fleshy tentacles, which are covered by minute touch receptors called "Eimer's organs". The star has a diameter of more or less 1 cm (0.4 in.) and contains about 25.000 Eimer's organs. The star-nosed mole is virtually blind and is hypothesized that it uses the star like nose to detect electricity produced by prey when hunting. Some studies indicate that with the help of Eimer's organs, these moles may also be able to detect seismic wave vibrations. These odd looking creatures are also known for their ability to smell underwater. They accomplish this by exhaling air bubbles onto objects and then inhaling the bubbles back again, thus carrying the scents to their nose! 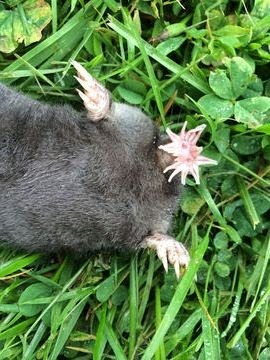 Star-nosed moles prey on animals that live in the wet lowland areas that they inhabit. They create swallow tunnels for foraging, but they are also good swimmers, foraging in the bottoms of nearby ponds and streams. They are believed to be one of fastest eating mammals. According to a few reports, it takes them an average of 227 milliseconds to identify and consume individual food items! It takes them only 8 ms to decide if a prey is edible or not. Little is known about their social behavior. They are suspected to be colonial animals, sharing their tunnels with other members of the group. It has been reported that mothers are assisted by other members, for raising the young ones. How these animals interact remains a mystery. Captive specimens produce few vocalizations, however, the relatively large external ear openings suggest a role for vocal signals. Tactile and chemical cues may be used as means of regulating social encounters. Mating takes place late in the winter or early in the spring. Females give birth to one litter (consisting of 4-5 younglings) late in the spring or early in summer. If, for any reason the first reproductive effort is unsuccessful, females may mate again, producing a litter as late as July. The newborn hairless moles are 5 cm long (~2 inches) and weigh about 1.5 g. The eyes, ears and nose are closed and become usable after half a month. The youngs become more and more independent after the age of 1 month. Sexual maturity is reached at the age of 10 months old. Star-nosed moles seem to have only one mate per breeding season, little is known about how the star-nosed mole finds or attracts a mate. On average, the gestation period lasts 45 days. Is the star-nosed mole threatened? 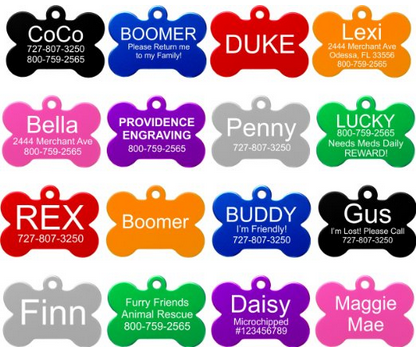 They are relatively common animals and currently humans don't impact the species or their habitat directly. Sometimes, large numbers of the animals do get caught in muskrat traps, however this doesn't seem to seriously affect their number, as a result the animal doesn't appear to be threatened, at least not for the moment. Nevertheless, the continuous expansion of humans to more and more places (including wetlands), may pose a threat for the star nosed mole sometime in the future. For now, the species is listed as of Least Concern by the IUCN. - It takes them as little as 230 milliseconds to identify prey and eat it, taking them only eight milliseconds to determine whether it is edible or not. - State University of New York, College of Environmental Science and Forestry. Adirondack Ecological Center: Star-nosed Mole. - Hammerson, G. (2008). "Condylura cristata". IUCN Red List of Threatened Species. Version 2009.2. International Union for Conservation of Nature. - Feldhamer, George A.; Thompson, Bruce C.; Chapman, Joseph A., eds. (2003). Wild Mammals of North America: Biology, Management and Conservation (2nd ed.). Baltimore, Maryland: Johns Hopkins University Press.